Everyone wants to be known for something, some are more focused on intelligence and others on their soul. Each person wants to be seen a certain way, even if they don’t show this towards others. 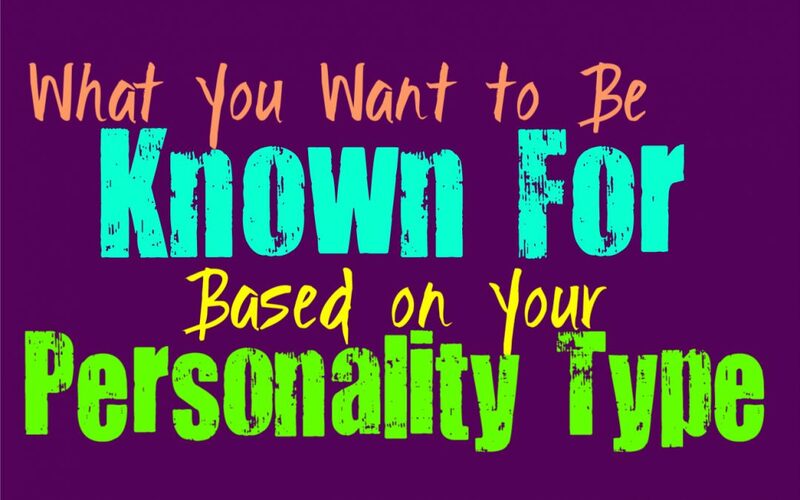 Here are the things you most likely want to be known for, based on your personality type. INFJs can sometimes struggle to really recognize the way in which they want others to see them. While they are caring and compassionate people with big hearts, they also want people to recognize their capabilities and talents. They often want others to see what they are capable of, but might be afraid to really show it to them. INFJs want to be seen for many things, but deep down they just want to be valued as someone who is capable of making a difference and being recognized by those who love them. ENFJs are compassionate people who take care of their loved ones, but they often want to be known for much more than that. While they are often recognized for the way they seek to please others, ENFJs can become bothered by the fact that the deeper parts of themselves can be overlooked. They often want to be known for their minds and their strong spirits, and so they seek to show others these parts of themselves. ENFJs can often see that people miss the more complex parts of their personality, as well as their desire to seek out knowledge. INFPs often want to be known by their strength of character, as well as their unique spirits. They don’t want people to miss the fact that there is much more to them than what is seen on the surface. Most people will overlook the complexities of the INFP, because they are seen as being so focused on their emotions. INFPs want people to see their desire to absorb knowledge, as well as their strong sense of morals and ideals. They don’t want people to miss these parts of themselves, and so they want to be known for more than their emotional side. ENFPs want to be known as someone who is capable and even a bit impressive. They want people to see their intelligence, not just their complex morals and emotions. ENFPs don’t want others to just see their draw to emotions or their desire to bounce around, for them this is only the surface layer of who they are. They want to be known for their minds as well as their spirits, and so they want people to see just how capable they are and how much they crave knowledge. While INTJs do want to be known for their minds, they also want to be known for their all-around knowledge. They want people to recognize that they are not ignorant people, and that they will avoid this at all costs. INTJs believe in the search for knowledge and they feel it is truly important to always be growing and learning. People who are willingly ignorant are truly frustrating for the INTJ, and rarely possess as much value as people who do their best to learn and understand the world around them. ENTJs want to be known for bother their efficiency and their inner strength. They want people to see just how strong they are and how capable of learning they are. ENTJs don’t want to just be seen as someone who is filled with a sense of knowledge, they want people to also recognize their depth and complexities. They are often deep and creative people, who care about being viewed as someone who possess more than what can be seen on the surface. INTPs can struggle to really figure out what they want to be known for, sometimes they just want to be left in peace. Part of them down want to be known for something great though, and this part can struggle to really figure out what that is. For INTPs it can be challenging to imagine being known for just one thing, since they don’t want to be trapped into this idea. They want to feel free to explore different sides of themselves and often want people to see them as many different things. They want to be known for their minds, their capabilities and so many other sides of themselves. ENTPs are often searching for the things they want to be known for, constantly exploring different options. They don’t like the idea of being trapped in one idea of who they are, and so labeling themselves can feel a bit uncomfortable. ENTPs might not want to be known for just one thing, and so they might overanalyze what this actually means to them. They want to find out what means the most to them and ultimately decide based on what they want others to really see. ISTJs often want to be known for their strength of character and their efficient capabilities. While they want people to see their ability to get things done, ISTJs also want people to understand that they are caring providers as well. They work hard to take care of their loved ones and ensure their protection, and this is something they want others to actually recognize about them. ISTJs might be efficient and hardworking, but there is a lot more to them than that. ESTJs often want to be known for the strength of their character, as well as their ability to overcome anything. They are strong-willed people and they want others to know just how much they can handle and accomplish. They do want to be noticed for their abilities, and often strive to show others their talents and intelligence. ESTJs also want people to see their connection to their family and their desire to take care of their loved ones. ISFJs often want to be known for their compassion and their ability to provide for their loved ones. They want people to see their kindness and just how hard they work for the people they love. ISFJs care about others and they want the world to recognize just how much they give up for others. They want people to see this and they also want them to notice how much they can accomplish because of it. ESFJs often want to be known for their selflessness and just how much they will do for their loved ones. They want people to recognize how hard they try, since they often feel like this goes unnoticed. ESFJs care about others and they do whatever they can to protect them, and this is something they want to be known for. ESFJs also want to be known for their minds, since this can be something that people overlook because of their sense of empathy. ISTPs don’t often strive to be known for things in a way that will trap them into a narrow view. They want to feel free to explore different options and don’t like when people try to control them in any way. Sometimes how they are reflected to others can definitely be something that causes the ISTP to feel a bit trapped. Most of the time they prefer to remain a mystery most people and want to be able to avoid too many expectations. ESTPs want to seek out new experiences and in some cases would rather remain a bit of a mystery to most people. While ESTPs want to be seen as someone who is capable and intelligent, they also enjoy when others can recognize how hard they try. ESTPs can bounce around and sometimes make rash decisions, but they don’t want this to be what they are known for to the rest of the world. ISFPs often want to be known for their creativity and passionate heart. They want people to recognize them for who they truly are, not just what they can see on the surface. ISFPs want people to love them for who they are, and so they want their sincerity to ring through. ISFPs are moral people with strong inner emotions and this is definitely something they want people to recognize. ESFPs often want people to notice how positive and fun-loving they are, as well as their intelligence. People often notice that they enjoy living in the moment and want to have fun, but they want people to see much more than that. ESFPs are also deeply caring people who do whatever they can to make their loved ones feel a sense of joy, and this is something that often goes overlooked about their personality.